David Robert Coleman was born into a German-English family in London in 1969. He studied piano and conducting at the Royal College of Music London as well as reading music at King’s College Cambridge. Further private studies in composition ensued with George Benjamin in London and later Wolfgang Rihm in Karlsruhe. Coleman’s main base over the last twenty years has been in Germany. Initially he worked as an assistant-conductor at the Southwest German Radio Orchestra Baden-Baden, then with Pierre Boulez in Aix-en-Provence Festival and from 2006-2010 with Kent Nagano at the Bavarian State Opera. He has also assisted Daniel Barenboim at the Berlin State Opera. Coleman received a composition stipend from Hans Zender to work at Schloss Solitude in Stuttgart, he also was a prize-winner at the international composers’ competition of the Opera Frankfurt in 2000. 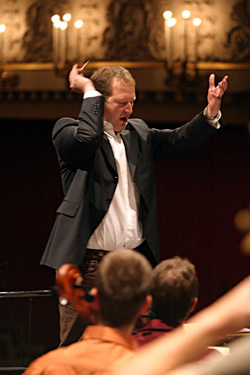 In the last years David Coleman has become a sought after guest-conductor having received invitations to conduct orchestras such as the Frankfurt Radio Orchestra, Southwest German Radio Orchestra, Bremen Philharmonic, Junge Deutsche Philharmonie, Bavarian State Opera, Berlin State Opera, Philharmonia Orchestra, LPO London and Orchestre Symphonique de Montreal. He has conducted the first performances of works by Gerald Barry (‘The Road’), Philippe Manoury (‘Abgrund’), Xenakis (‘Kai’) and the first performance of Boulez’ ‘messages esquisses’ in a version for violas. David Coleman has been commissioned to write works for the Frankfurt Opera (‘Herzkammeroper’), Ensemble Intercontemporain (‘Deux’), Orchestre Symphonique de Montreal (‘Ibergang’ clarinet rhapsody) as well German regional orchestras. His works have been performed mainly under his direction by Ensemble Modern Frankfurt, Southwest German Orchestra, Berlin Philharmonic, Youth Orchestra of the Americas (‘Albeniz Phantasy for Viola and Orchestra’ with violist Edmundo Ramirez), Frankfurt Radio Orchestra, Oldenburg State Orchestra and Jena Philharmonic. Recently he has written a series of chamber-music pieces for soloists of the Berlin State Orchestra (Berliner Staatskapelle). In 2012 he was commissioned by Daniel Barenboim to make a new version/orchestration of the third act (London scene) of Alban Berg’s ‘Lulu’ from the extant sketches. This version was performed for the first time at the Berlin State Opera in March 2012. Future commissions include a new work for soprano and orchestra for Daniel Barenboim and the West-Eastern Divan Orchestra as well as chamber-music pieces for the Jerusalem Chamber Music festival. Coleman’s style is a synthesis of various European post- and pre-serialist strands. His approach is non-dogmatic and informed by his practical experiences as a conductor. An immersion in the music of Alban Berg, Boulez and the teachings of Messiaen are central to a personal search for musical expression, form and colour. Currently he is based in Berlin.